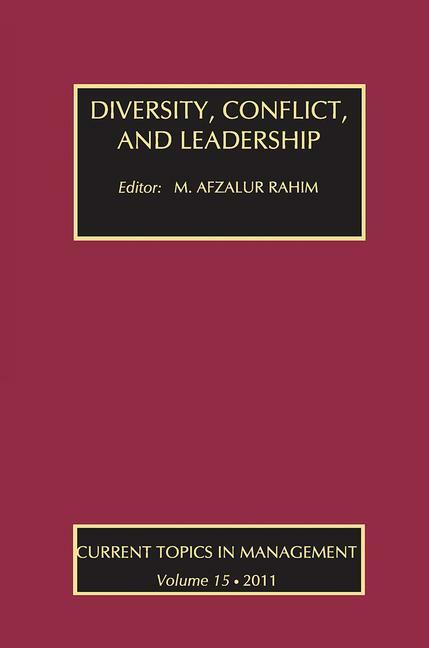 Current Topics in Management is an annual scholarly journal and this volume is divided into four major sections: Managing Conflict and Justice; Leadership, Social Capital, and Personality; Entrepreneurship and Small Business Management; and Ethics, Learning, and Change. These contributions seek an integration of theory, research, and practice, which is the essential goal of Current Topics in Management. The first section contains two empirical studies on organizational conflict and a theoretical work that addresses the application of organizational justice theory to consumer behavior. The second section contains three empirical studies relating to the leadership language used by senators Hillary Clinton and Barack Obama during the last presidential election, building social capital through leader-member exchanges, and the big-five personality and financial performance of fund managers. Section three contains an essay on revising Phelan's model on entrepreneurship and a case study on a small business organization. The fourth section contains three contributions, two theoretical papers and an empirical study of the administration of state governments. The contributions included are "The Moderating Role of Social Attitudes on the Relationship between Diversity and Conflict" "The Effects of Geographic Dispersion and Team Tenure" "Fairness and Consumer Behavior" "Obama vs. Clinton: Exploring the Impact of Leadership Language" "Social Capital Via Leader" "Financial Performance of Fund Managers" "A Conceptual Framework Linking Entrepreneurs to International New Venture Competitiveness" and "BSL Printing Company: A Case Study."